Hairstyles define one’s choice and reflect the inner personality as well. At times, choosing a hairstyle might be difficult. The hairstyles depend on the length of the hair, face cut and texture of the hair. Hairstyles must be chosen so that it brings out the best features. For example, if someone has thin hair, the hairstyle can be chosen to make the hair texture look thicker. Waterfall Braid Hairstyles are the most common and the most popular among various other hairstyles. The waterfall is one of the easiest styles to make in the hair. It also looks very beautiful. 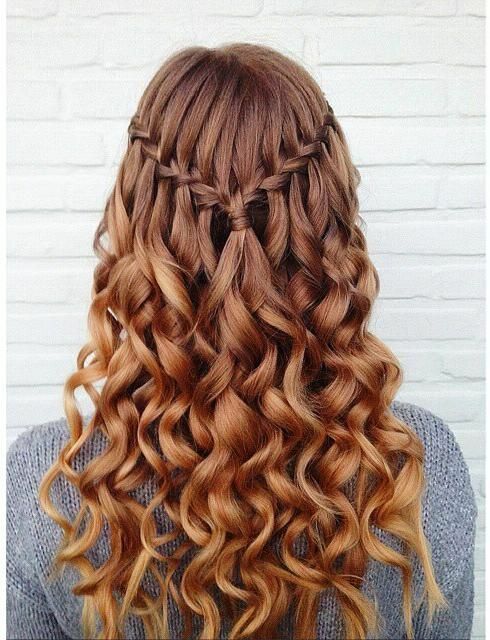 The waterfall braid looks best in long hair. But it can also be made to look classy in short hair. People having straight hair can flaunt this hairstyle very well. It is the look which can be carried for an elegant, formal or casual look. There are many ways a waterfall braid can be made in the hair. The advantage is that the waterfall braid can be perfectly carried off with any face shape. Waterfall braids are also very much in trend for a long time. This waterfall braid style can be best carried off with women having thick long and blonde hair. The hair is straight and long. The waterfall braid has been elegantly done on the side of the head. The hair strands are slightly curled towards the ends. The braid has been neatly so that it looks prominent. A neat makeup of highlighted eyes would suit this hairstyle well. This is a unique hairstyle which can be worn with any elegant or casual dress. This is a slight variation of the classic waterfall braid. The four strand waterfall braid would suit perfectly for women having mid-length hair. Four sections of hair have been taken to make the waterfall braid. The outer sections of the waterfall braid have been pulled just a bit to make the braid look thicker. The hair length is below the shoulders. The hair is wavy especially towards the ends. This braid can be made on both sides of the head. The hair has been done up extremely carefully and neatly to make this hairstyle. The texture of the hair is thick and fine. Small sections of hair from both sides have been used to make the waterfall braid. Ending just below the braid, the hair strands have been beautifully curled. The curling has been done so that the hair strands look like they are falling below the braid. The entire hairstyle is kept neat and careful so that a single strand of hair is not out of place. The waterfall braid with highlights is a slightly bohemian look. The hair length is long and the strands are highlighted. The hair strands emerging from the waterfall braid have been curled at the ends. Rest of the hair has been kept straight. The waterfall braid is done taking hair strands from both sides of the head covering the entire crown. The hairstyle is kept a little messy to complement the bohemian look. The waterfall braid is also done a bit messy to suit the entire hairstyle. 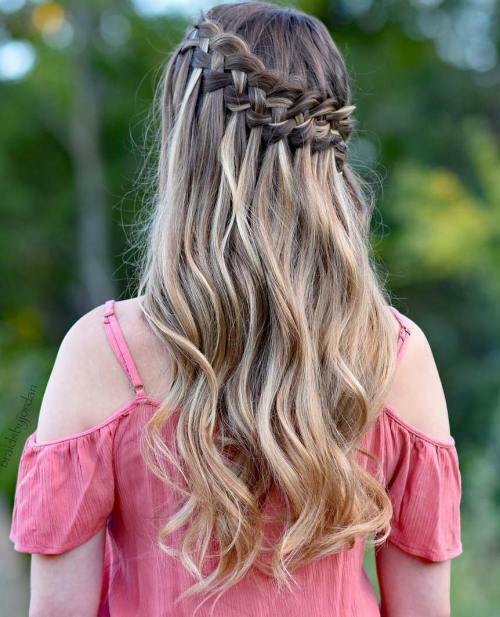 The two section angular back waterfall braid hairstyle is one unique variation of the regular waterfall braid. The braid has been done taking two sections of the hair. The hair length is long and it has volume in it. The hair texture is kept a bit messy and casual. The casual messy braid has been done from the top of the head. It has been extended till the below of the head at the back. Like the name, the hair is highlighted in caramel color. This hairstyle will suit women who have thick and voluminous hair. The length of the hair is also long. The topmost portion of the head is kept smooth and straight. 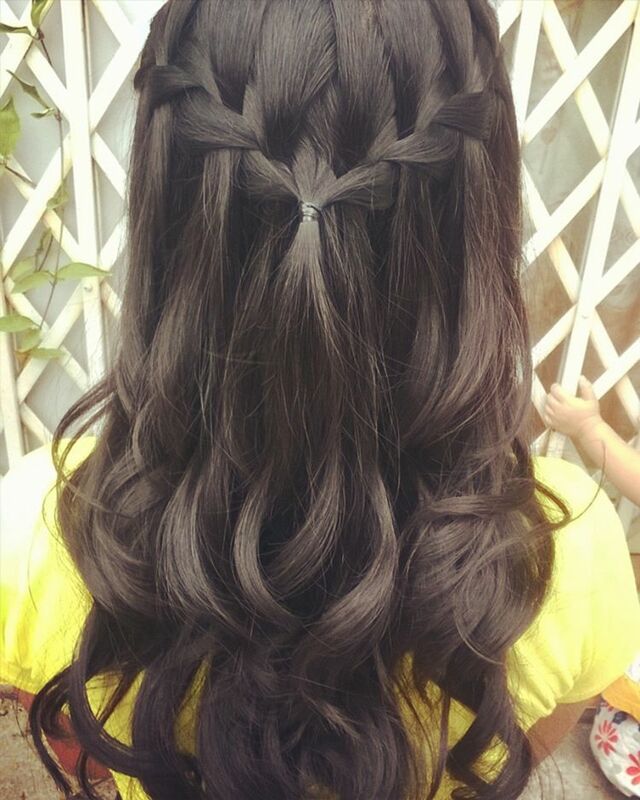 A neat and thick waterfall braid has been done at the back of the head. The extending hair strands have been elegantly curled at the ends. The heart shape is an extremely stylish and cute hairstyle. Taking small sections of hair from all the sides, a heart-shaped braid has been made at the back of the head. The hair is kept neat and sleek. The hair ends have been slightly made wavy at the ends. This look can be carried off with a cute dress for a romantic date or any special occasion. The half up half down double waterfall braids are a fresher version of the waterfall braid. This style is so gorgeous that it can be worn for any wedding or formal occasion. The waterfall braid is done at the top of the head and down as well. The length of the hair is very long which makes the hairstyle prominent. The two waterfall braids are joined by single strands of hair at every braid. The rest of the hair is kept free-flowing and wavy. The waterfall braid can also look good in the short hair as well. The side waterfall braid for short hair is the best hairstyle to demonstrate that. The hair length is short and till the shoulders. The short hair is highlighted and made wavy. The waterfall braid is done loosely on the side of the head. Few loose strands have been left open at the front. The hair is left a little messy at the ends. The waterfall braid with rosette bun is an elegant style which can be worn with an elegant dress for a formal or social gathering. The hair length is very long and the entire hairstyle is kept very neat. A thick waterfall braid has been done taking thick sections of hair. The ends of the waterfall braid have been made into a rosette bun at the side of the head. The waterfall braid hairstyle looks gorgeous on silver blonde hair with highlights. The hair strand, especially at the ends, is made wavy. The length of the hair is long and extends down the shoulders. The waterfall braid is done very carefully and neatly taking thin strands covering the top portion of the head. The falling strands have been left open and made into slight waves. 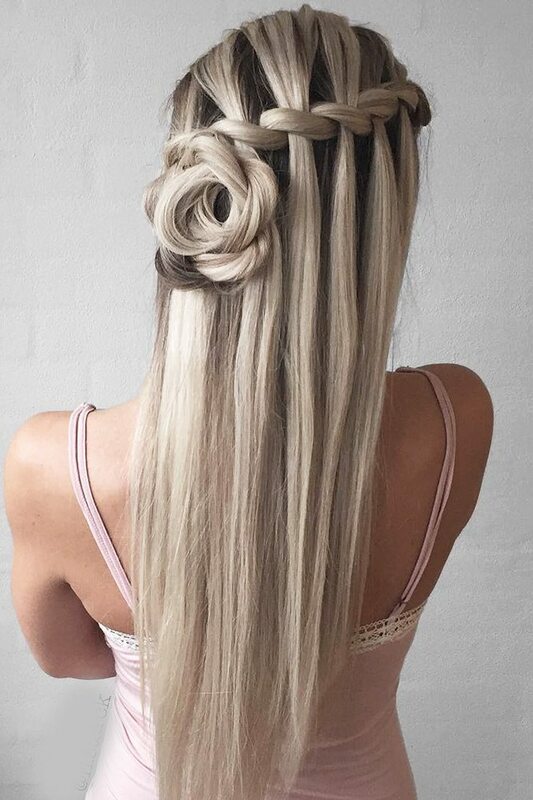 The five strand waterfall braid is a unique hairstyle which can be worn with casual or an elegant dress as well. Like the name, the waterfall braid is done taking five sections of hair from the head. The braid looks a bit thicker. The braid is done neatly at the back of the head. The free-falling hair strands have been made wavy. The ends have been slightly curled. For making the mermaid hair with double waterfall braids, very long length of hair is needed. The style looks better on a long length of hair. Double waterfall braids have been done in the hair taking very thin and fine strands of hair. The braids have been done neatly. The entire hair is kept slightly messy and wavy. Rest of the hair is kept free flowing and loose. This elegant hairstyle can be paired with minimum jewelry and any casual or semi-formal dress. For making this hairstyle, long length of hair which is sleek is desirable. The long hair is neat and sleek. The voluminous hair makes the braid more prominent. Taking thin sections of hair from one side, a neat waterfall braid has been made. This neat look will look best with a formal wear or a casual wear. A neat makeup would definitely complement the look. The braid is kept a bit thicker to make the style more elegant. When it comes to prom, a perfect hairstyle is what everybody needs. The waterfall braid can be done nicely and elegantly to create the perfect prom look. The thick and long hair is made wavy and slightly curled at the ends. The thick braid is made taking thick sections of hair. Rest of the hair is left open and curled at the ends. The thicker texture of the hair makes the entire hairstyle elegant and gorgeous. The creative waterfall braid hairstyle is done up elegantly to create a fresher version of the traditional waterfall hairstyle. The waterfall braids are done in double layers. The open ends of the first braid have been merged with the second braid. The length of the hair is long. The texture of the hair is fine. The hair ends have been made slightly wavy. This look can be easily carried off with any casual or semi-formal dress.